TeeMack.net: For One Night Only - Knuckleheads - Kansas City, Mo. For One Night Only - Knuckleheads - Kansas City, Mo. 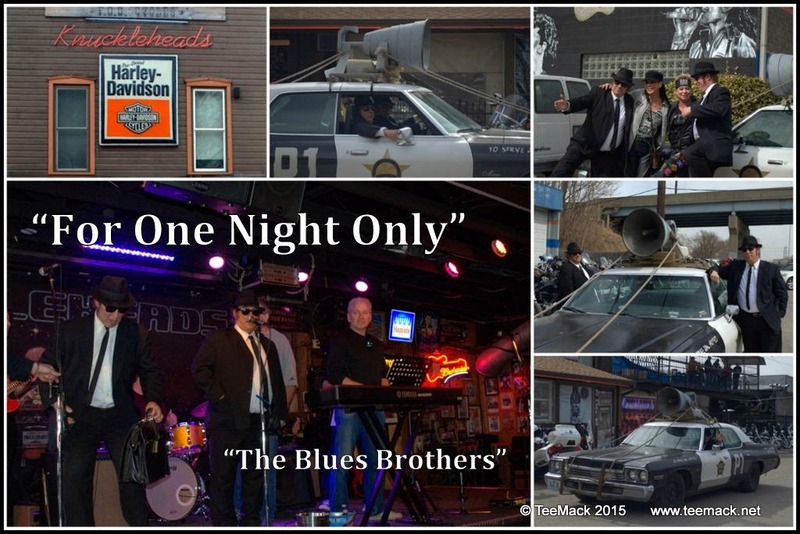 For One Night Only, the Blues Brothers, joined the Jam Sessions at Knuckleheads in Kansas City, Mo. on March 8, 2015. Knuckleheads, formerly known as F.O.G. Cycles is located in the Northeast section of Kansas City, Mo. The Sunday afternoon Jam Session started about 1pm on a beautiful sunny day in Kansas City, Mo. Jake and Elwood showed up about 2pm. After several other musicians performed, Jake and Elwood, got up on the stage to perform. After there session, Jake and Elwood mingled with the crowd, before leaving to attend another Jam Session in the City Market area of Kansas City, Mo. Everyone enjoyed the beautiful weather and the great music. Click here to view photos of the event.